I went to Göttingen last week to talk about modality, which is turning into a pleasant tradition. 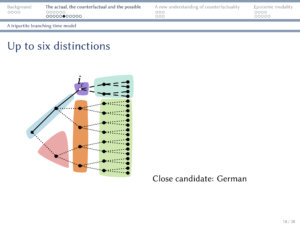 In my talk, I outlined the typological debate on the irrealis distinction, introduced the tripartite branching-time model that I think will help us the relevant cross-linguistic variation, and discussed how the same approach also sheds new light on some long-standing questions about the nature of modality, counterfactuality and epistemic necessity. You can find the slides here. Next Next post: Storyboard books in Daakaka.